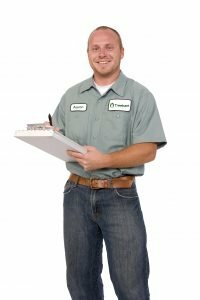 Licensed inspectors should be inspecting all areas of your home. While every review should be complete, there are certain areas of the check-up that should be focal points. These areas listed below are some of the most common areas of infestation for the city of Orange. If your home is located within the historic district of Orange chances are you have a high exterior wood count. The California Bungalow (https://en.wikipedia.org/wiki/Bungalow) was constructed during the city’s incorporation. This style of home uses a lot of exterior paneling, window trimming, and fascia boards. Attention needs to be paid to the exterior of these custom homes. All attics need to be inspected per Structural Pest Control Boards guidelines. Orange is no exception. Homes in Orange need to be examined more thoroughly in the attic as infestation from the exterior is more likely. Termite Damage inside the Attic is an indicator that there is infestation within the walls. Proper inspection and diagnosis of treatment required for total control. The original plans for the homes built during the city’s incorporation included raised foundation homes. If your home was constructed before 1955, it is likely to have a sub-area. These areas have an access point inside or outside the home for entry. Often this area is one of the least inspected areas of the home due to the difficulty of entry. Regular inspections should take place. Typical Orange construction included a single car detached garage located in the back of the home. A long driveway is not uncommon for parts of Orange because of the Detached Garage. It should be inspected thoroughly due to most residents choosing not to drive into the garage. In the cases, I have seen the driveway is used for parking. The garage is often used for storage and not often inspected by the homeowner. Why Does Orange Suffer from Subterranean Termites? Why Does Orange Suffer from Drywood Termites? Drywood Termites have a smaller colony size and shorter maturation cycle. Shorter maturation periods allow for the colony to produce winged Alates much quicker than Subterranean Termites. Once the Swarmers have been born, they prepare for flight and re-infestation elsewhere. In clinical studies, Subterranean Termites usually take five years to produce Swarmers whereas Drywoods 2 years. This allows Drywood Termite colonies to spread more rapidly leading to widespread infestations citywide. 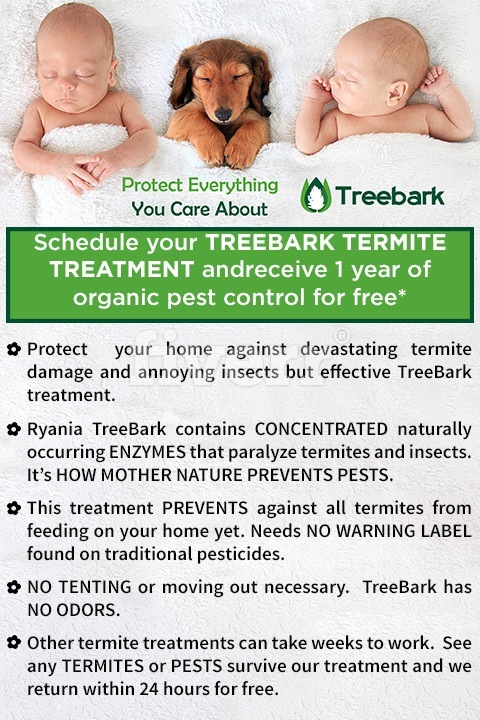 Treebark Termite and Pest Control tackles termites from the “everything or nothing” approach. 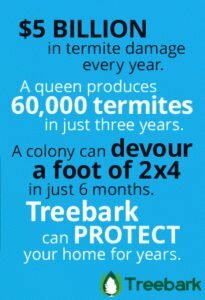 We only perform services that control all termites on the property not just Drywood or Subterranean. Competitors of ours might offer Drywood Termite Control via Fumigation (tenting the structure) while not addressing the potential for a Subterranean Termite Attack. This causes frustration when a Subterranean infestation appears at a later date. These types of competitors seem inexpensive until you add their prices up and compare to our regular Treebark service. To not be covered for this or that type of termite after treatment is not a solution. Termite Control in Orange doesn’t have to be Fumigation! Termite make my life miserable; after I found their location they already in depth of every corner. I gave my first call tom treebark termite and pest control. They gave me estimate value and no. of days to fumigate. Their work was better than market and cheaper. 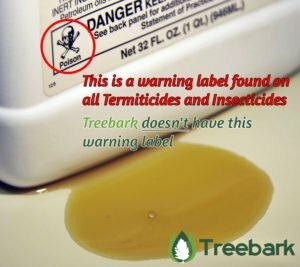 I Recommend Treebark termite for their excellent work and response They were on time Give a video feedback for safety Price is low as compared to others. Treebark is a Registered Trademark of Brand Management Solutions, Inc.